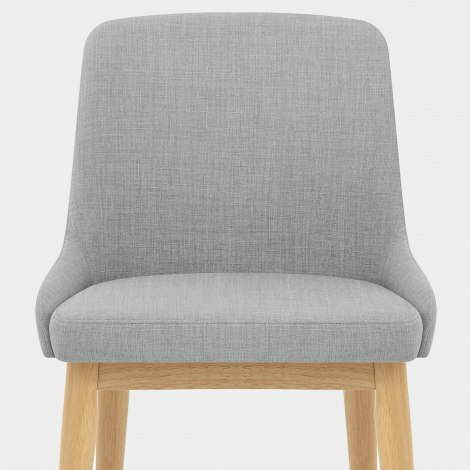 A modern take on a classic design, the Jersey Dining Chair Oak & Light Grey will not disappoint with its simple and stylish look. A versatile model that can be used in a wide range of rooms, the Jersey is a charming choice that your guests will adore. 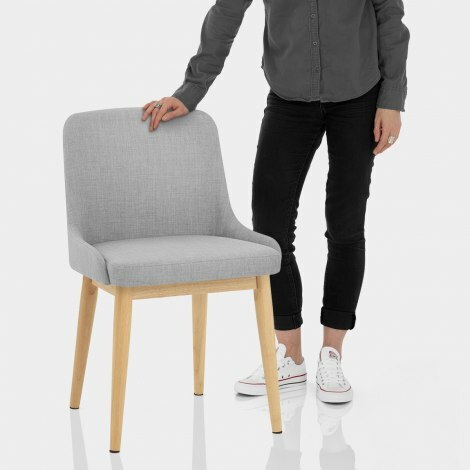 Upholstered in a trendy shade of light grey fabric, its comfortably padded seat and backrest offer ample support, whilst subtly curving round the sides for fashionable flair. Set on a solid wooden frame with a natural oak finish, each of the four legs is capped with a protective plug to help limit scuffs to flooring. 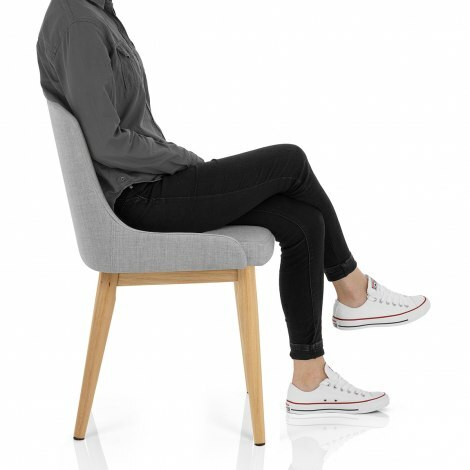 "Comfortable, practical and classy, easy to assemble"
Very comfortable, well supported and well made chairs. Heavy and substantial construction that gives an up market feel to them, without a hefty price. Easy and quick shopping experience and unusually quick delivery to Jersey, ordered Friday delivered Wednesday. Can't find any negatives in either product or experience. Excellent! Even the cat prefers them to her basket! Fast free next day delivery, time slot within 1 hour. Very good quality. Very happy customer, again! I’m really pleased with my purchase of the Jersey Dining chairs in oak and light grey. They arrived the next day, well packed and easy to assemble. Look really stylish with my old pine table which I have chalk painted the legs and base in grey and repolished the pine top. The chairs are really stylish and comfy to sit on. Would highly recommend. Very pleased with the chairs. Good value and they are extremely comfortable. I ordered four chairs while house-bound during the snow courtesy of the beast from the east. I did not expect next day delivery under the circumstances but Atlantic/DPD absolutely did much to my amazement and pleasure! I am very happy indeed with the chairs, they look great, are comfortable and very easy to assemble. For the price, these are excellent value especially if compared to a very similar version sold by John Lewis for £399 each. Hopefully the chairs will continue to look good once they are being used on a daily basis. Thank you Atlantic for a great product.